Task types is an identity of a task representing of the particular task group. It can be different for different industries and organizations. TimeLive provides few pre-defined tasks with an option of adding your own required task types in the system. Click + Add Task Type green button on the top-right side of the application. 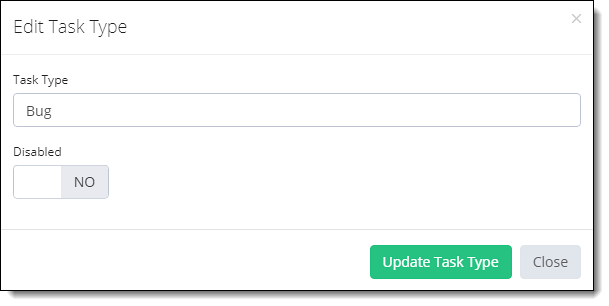 Enter new Task Type in Task Type form which you want to add. Click on Add Task Type to add this in TimeLive. Scroll to the type you want to edit, click the Options gear icon and select Edit Task Type option. Make the changes in the Task Type field. Click on Update Task Type button to update changes. Scroll to the type you want to disable, click the Options gear icon and select Edit Task Type option. Click the Disabled switch to convert it to Yes. Click on Update Task Type.button to update changes. Click Admin Options * and scroll to *Project / Task Setup. Scroll to the type you want to delete, click the Options gear icon and select Delete option. Click the OK on the popup message for the confirmation.